The fastest way to identify, to treat and to document the physical impairments that cause functional limitations. Isokinetic testing provides physicians with valuable information regarding strength deficits and muscle imbalances that may predispose a particular joint to further injury. Information obtained through the tests provides your therapist and your physician with objective data used in monitoring your rehabilitation. This data is used to establish sound parameters to determine when it is safe to return to sport and to work. A test will take approximately 1 hour, depending on the joint(s) involved. Immediately following the test, the results are reviewed with clients. A summary report is forwarded to the referring physician within 48 hours. Exercise protocols are approximately 20 minutes in length. To achieve the maximum benefit, 6-9 training sessions are recommended. Strengthening on the Biodex accelerates both recovery time and gains in strength, power, and endurance. The Biodex’s unique impact-free acceleration and deceleration eliminates joint trauma, allowing clients to exercise and to be tested at a more functional level. The Biodex’s resistance continuously adapts to variations in client’s exertion due to weakness, pain or fatigue. The test and the exercise protocol are both very effective and reasonably priced. A one-hour Biodex test is $98.00. The follow up training exercise visits are $52 each. 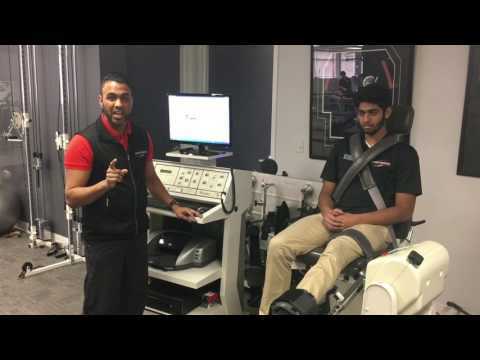 The test and training is provided by either a Registered Physiotherapist or a Certified Athletic Therapist and may be covered by extended health care plans. Some employers and extended health care plans may pay directly for the Biodex. WSIB may also cover the cost of the Biodex for chronic cases; clients should consult with their caseworker. Isokinetic testing is the standard for muscle and joint assessment. Research, along with over 25 years of clinical application, has demonstrated that isokinetic resistance is a safe and an objective means to quantify physical impairments or improvements.